Best 50 Travel Websites . . . Ever! 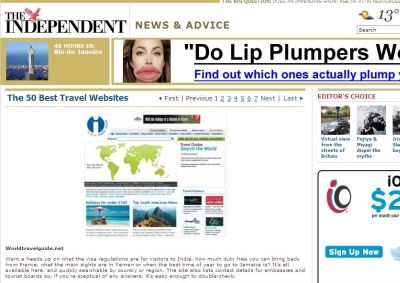 The Independent has a list of their top 50 travel websites, which, annoyingly enough, is readable only one click at a time (can you say “ad sales”?). So if you have about an hour to spare today (come on it’s Friday, of course you do), stretch out your right hand, grap a cup of tea and click away. I have no idea if TheExpeditioner made it. I do know that I sent the travel editors over there a large sum of cash inside an a rolled-up newspaper along with a dead fish, so I think they got the message.